(Lancaster, Pa., March 22, 2019) - Bryce Harper will not be the only member of his immediately family playing baseball in this section of Pennsylvania this summer. His older brother, Bryan, a left-handed relief pitcher, has signed a contract with the Lancaster Barnstormers for the 2019 season, it was announced today by manager Ross Peeples. The elder Harper, 29, signed with the Washington Nationals organization in 2011 out of the University of South Carolina. He spent a portion or all of four seasons at nearby Harrisburg and peaked at Class AAA Syracuse in 2016. Last year, in 44 appearances with the Class AA Senators, he was 3-1 with four saves and a 3.69 ERA. The right-hander’s career mark is 16-7 with a 3.66 ERA in 212 games, all in relief. 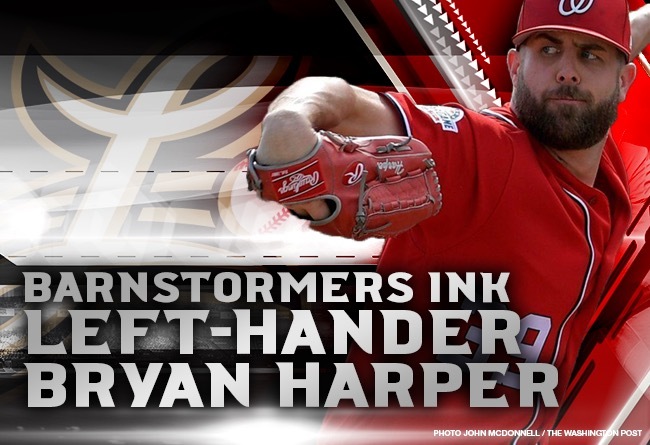 Bryan Harper becomes the 21st player under contract with the Barnstormers this season.